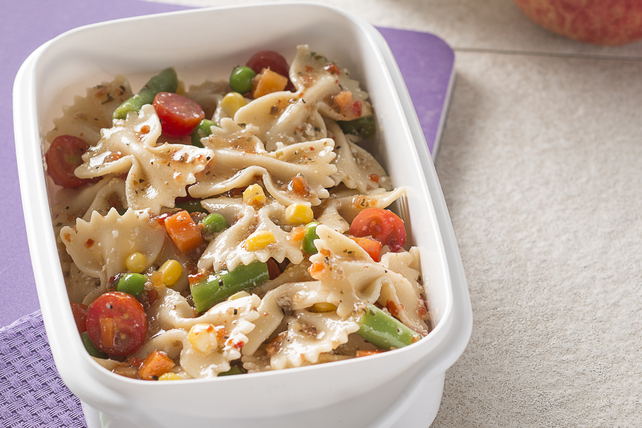 Our Garden-Patch Pasta Salad recipe is a great on-the-go lunch. Served with an apple and a serving of milk, this pasta salad puts a fresh spin on the brown-bagged lunch. Cook pasta in medium saucepan as directed on package, omitting salt and adding frozen mixed vegetables to the boiling water the last 3 min. Drain; rinse with cold water. Place in container with lid, Add tomatoes, cheese and dressing; cover. Shake gently to combine ingredients. Serve with apple and milk. Prepare using multi-grain elbow macaroni. This tasty pasta salad can be part of a healthy eating plan. As a bonus, the pasta provides a good source of iron, per serving.